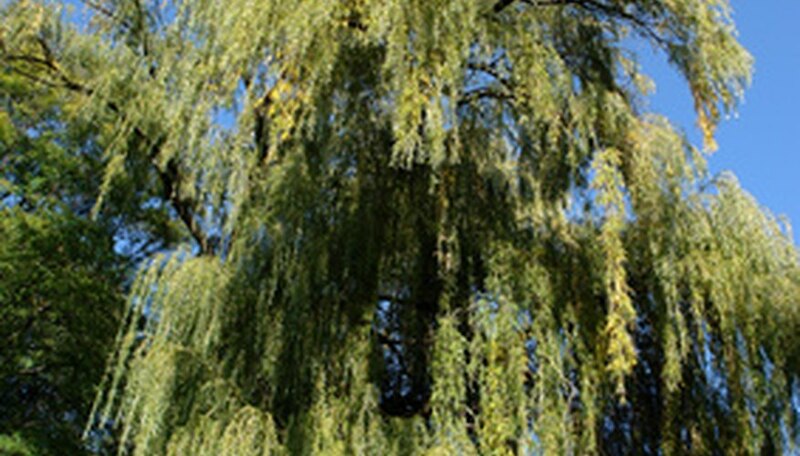 With more than 300 different species, willows are deciduous trees or shrubs. They have small flowers and simple alternating leaves. Some willow tree types are grown for their "weeping" ability, while others have colorful winter branches. Willow trees range from dwarf sizes to very large and require well-drained soils that are deep and moist. The corkscrew willow is a rapidly growing deciduous tree with course texture. Its upright, mounded form is slender and curled with contorted branches and twigs. The corkscrew willow grows between 20 and 40 feet tall and 15 to 25 feet wide, creating a commanding presence to the landscape. The simple green leaves range from 3 to 6 inches long. Corkscrew willow trees require full sun and moist soil to thrive. These trees are short lived and highly contorted as their foliage becomes dense. The USDA Hardiness Zone is 5 to 8. This rapidly growing deciduous tree has fine texture and a conical form. The stems are contorted and turn red in the winter. The hankow willow tree grows between 40 and 50 feet tall and 20 to 25 feet wide. The leaves are curled and simple and cascade down the branches. Hankow willow trees prefer full sun and a wide range of soil types. These hardy growers are also drought tolerant. The USDA Hardiness Zone is 5 to 8. Nishiki willow, a variety of willow, is a deciduous tree with a rapid growth rate. The Nishiki willow grows 4 to 6 feet tall and wide. The rounded, long and arching branches have small leaves that are variegated when young. The slender leaves range in colors from green and pink to white. Nishiki willows require pruning to promote the variegated foliage. They also require full sun to partial shade and grow in a wide range of soil types, making them very versatile. The USDA Hardiness Zone is 5 to 8. A variety of willow tree, the Virginia willow, has medium texture and a moderate growth rate. These trees have an erect form with clustered branches that are rounded and arching. Virginia willows grow 3 to 6 feet tall and 4 to 6 feet wide. The medium to dark green leaves on the Virginia willow grow up to 4 inches long and have fiery fall colors of yellow, orange, red and mahogany. The drooping white, fragrant flowers on the Virginia willow grow 3 to 6 inches long and emerge in early summer. The Virginia willow prefers full sun to part shade and moist to wet soils. The USDA Hardiness Zone is 5 to 9.